I installed a bunch of drawer slides yesterday. You know, the full extension, ball bearing steel kitchen cabinet slides where you are upside down in the cabinet with your head twisted to one side, holding the part on your marks with one hand while you try to find the screw you dropped with the other hand so you can put it in with the driver in your other other hand? Well, actually I don’t do it that way. I double-stick supports on the cabinet side, set the slide on the supports, adjust with a magnetic level, and bang in the screw locations with my handy spring loaded center punch. The punch leaves a nice dimple in the wood, so if the slide moves while you are getting your driver ready, you just realign the hole and the dimple and zip the screw in. The dimple is also a decent starter hole so the screws start easier. It occurred to me that not everyone knows about this handy helper. You can get them at home centers and hardware stores for 5 or 6 bucks. I have had mine for decades. There is no maker name on it, just the letters USA on the red handle. Not all of them have that handle, most are just grip and push. Most are adjustable; by unscrewing the top, you can lessen the impact of the punch. The picture shows two dimples, min and max impact on red oak. I’d be careful about using full strength on soft or brittle wood, it gives quite a bang. I’ve noticed one brand that had a sharper point than mine. Mine might be designed for metal working. I keep it in the drawer beside my power driver. Great little tool. Thanks for the review. The handle design looks great. +1 from me. 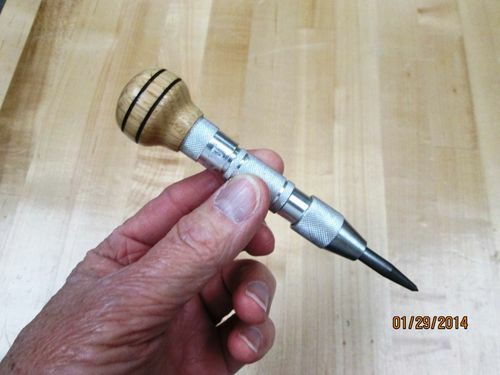 I was just using my center punch yesterday thinking I should post it as one of the handiest tools in my shop. 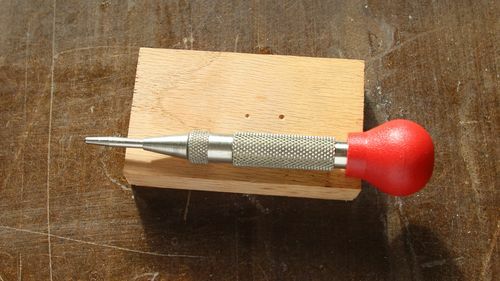 Every time I see someone using an awl to twiddle out a decent start for a screw or drill bit I am grateful for my simple inexpensive punch. They are available from most hardware vendors, HF sells them for less than $5. i have a broken one, how do these things fail? I’d like to fix it if its not too involved. I unscrewed it, and inside there is a spring and a small steel cylinder. Any ideas? Whee can you find spring loaded puntches . I had one but can’t find it anymore . Have you tried buy one lately. I tried buying one I was told they were illeagle to have. Kids use them to break windows in cars and they were outlawed. I’ve got one minus the red ball on the end. invaluable to make a dent mark in woods, plastic, and aluminum. I have one and love it. Make a mark, set a brad point bit and I get accuracy…at least for me it is accurate. Outlawed spring loaded center punches, seriously? patcollins—Sounds a little extreme to me, but I suppose they could do some serious damage to a car window/windshield. But so could a rock. Joseph, I have one from lee valley that broke (it gets a LOT of use). I checked again I found one at my home center it’s a US general like the one I lost $14. I have a brass handled one that I got with a few other tools when my grandfather passed on. I’ve used it myself for about 15 years and I’m pretty sure he had it for at least that long before me. It has no maker mark that I know of, just his initials etched in the handle. It works great on every material I’ve ever used, even stainless steel.